Uğur Altıntaş aka Ugur Project was born in 1982, in İstanbul Turkey. He started his music career when he was only 16 years old. Back then he was already a part of the first and only dance music radio station “Radio 2019”. While working and undergoing a hard training of Production and Radio Shows he met with Techno genre which amazed him at the first sight. After a while Uğur set sailed for another adventure on Turkish nationwide radio and television news channel “NTV”. Working in production jobs as a technical crew he got enough experience to form a New Radio channel “Radyo Eksen” with his fellow friends. 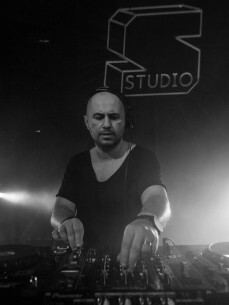 Between 2001 and 2004 he started to produce his own music and worked with the best dance music radios such as “Cool” and “Radio Quasar” while hosting a radio show that consists of techno sets. Kraftwerk, Faithless, Chemical Brothers, Moby, Richie Hawtin, Loco Dice, Luciano, Nicole Moudaber, Dixon, Acid Pauli, Matador, Mind Against, Andrea Oliva, Oxia, Edu Imbernon, Umek, Paul Ritch, Matthias Tanzmann, Harvey Mckay, Ten Walls, Argy, Ray Okpara, Marc Houle, David Keno, Einmusic, Sabb, Raving George, Jennifer Cardini, Super Flu, Digitalism, Tim Green, German Brigante, Valentino Kanzyani, Subb-an, Rhadow, Dj Wild and many more.. Especially with his performances in İstanbul and Radio&Tv shows he both hosted and attended he got the chance to made the crowds hear his music. Even with his busy schedule between 2010 and 2013 he managed to host a radio show called “HardGroove” at Dinamo FM 103.8. Musically speaking innovation is his motto. With the projects he put through he managed to bring a new meaning to night life. He organized parties at the biggest night clubs back then. Biggest example to that is “Technodays”. It was the first performance ever in Turkey with 9 records players, 3 mixers and 3 DJ’s playing at the same time. When he was only 23 years old he already reached his 500th performance mark. At that night he decided to tribute his DJ’ing career with a production career. His first project was his track “Turn Around” in the Turkey’s first electronic music compilation album “Future Sound Of Istanbul House Workz” released by EMI and Prosound. This track helped Uğur to demonstrate his production skills and also helped foreign Recording Labels to discover the artist. Just after signing a contract with FHD Records, at 5 May 2008 he released “Turbulence EP” with FHD Records a highly respected company based on UK. Only 3 months later “Zeplin Ep” was released. While improving his production skills and spending most of his free time to music, he started working with more and more Recording Labels. And without a surprise he got a lot of good feedbacks along the way. After the digital releases Uğur was quite excited about having his first record released by the German Record Label “Thokadee”. After the first week of release his “Dope Ep” was already reached number 4 at the list. One of the special things about this Record was its colour. It was white and the B side of the record has the symbol of moon and the star symbolizing Turkish flag. Coming right after one another his other records share the same success with his first records. His works got remixed by Spencer K, Alex Q, Francesco Bonora, Cess, Alex Costa, Ronan Portela, Oscar Barila, Jay Kurmis, Israel Vich, Sergio Parrado Mario Aureo, IPagan and helped his music to reach the masses. After all the hard work he started to cooperate with internationally famous names. Spending his free time mostly in the Studio Uğur was in over 35 Vinyl, 250 Digital EP, 500 Compilation albums and remixed over 50 artists. Without productivity concerns he is known as hardest working DJ/Producer. aylık olarak club ve festival performanslarına devam ederken öte yandan her cuma gecesi, İstanbul'daki en iyi dans müziği olan FG 93.7'de radyo programına devam ediyor. Spending his free time mostly in the Studio Uğur was in over 35 Vinyl, 250 Digital EP, 500 Compilation albums and remixed over 50 artists. Without productivity concerns he is known as hardest working DJ/Producer. Within all the fuss he is performing at clubs every month.